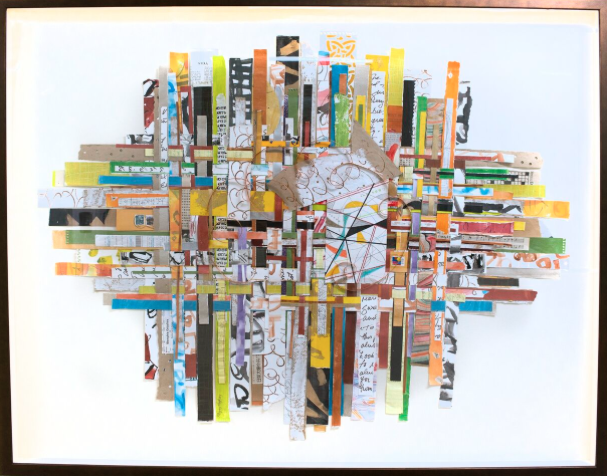 “Coming Together”, by artist Peggy Hughey, is a weaving of colors, art fragments, textures and momentos joining and becoming one. This piece was inspired by an array of hand embroidered linens Hughey came across while browsing an Antique Mall years ago. Her finding reminded her of a combination of all her old drawings, art works, collections and anything interesting and she discovered that the ‘Warp and Welt’ world of weaving opened a new art path for her. It gave reason for ‘The Hunt’ as many who love antiquing understand. To Hughey, it’s this combining of the ‘here and there’, the lost and found, the colorful and calm making a paper tapestry, a “Coming Together”. This beautiful piece is sponsored by Eileen and Steve Wishnia.